Scan and manage your inventory more efficiently than ever. Create categories and departments for a better control. Take a step forward and get quick update on stock position for multiple locations, set up minimum, maximum and re-order levels for periodic or quick review. Analyze fast moving, slow moving or non moving items to allocate space or take an action for a quicker disposal to ease out the storage and working capital pressure. Products can be sold - in bulk, loose quantities, part of a packaged kit and more. Position and package your products based on customer needs and profit. Item deposit and recycling fees can also be tagged with inventory item. Our inventory system allows you to print barcode labels, tags, etc. System also facilitates searching of inventory items by its UPC Code, item name or Customize your tax rates by outlet, or for individual products. We also support various flexible tax implementations like PST, GST, etc. Capture customer data without any extra effort while serving them and use this to analyze their purchase history, preference and to suggest a repeat order/service for suggested results and savings. Share upcoming offers, special discounts, pre-sale review and new product launches. Offer loyalty points for choice purchases. Big ticket customers can also be offered credit limit for prolonged relationship. 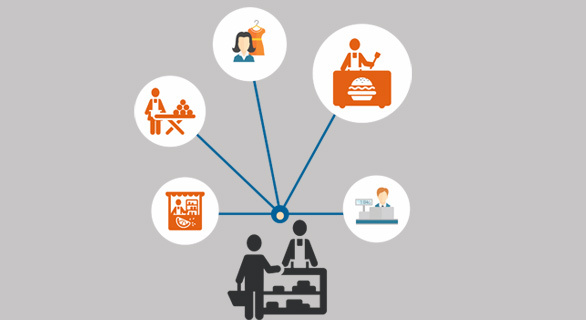 Book client appointments right into your POS and manage your future orders. Hold any order, take partial or on account payments for flexibility. 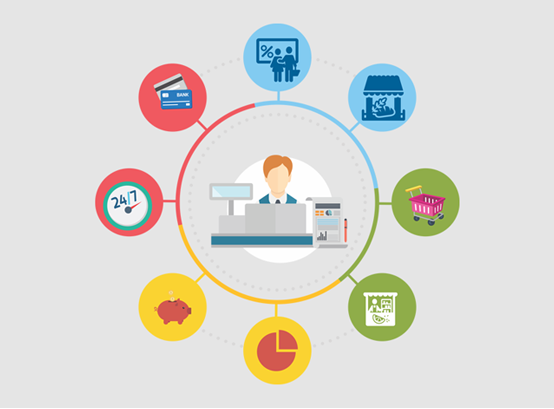 In commercial POS set up, business needs multiple device integration to support different activities including Receipt Printer, Kitchen Printer, Debit Card Machines, Caller ID, Weighing Scale, Label Printer, biometric scanners etc. to boost up the performance at each stage. Our POS system is integrated with all of them. We are already integrated with majority of merchants in the market. These integrations are largely accepted and are certified by merchant service providers. Debit Card Machine integration rules out manual inputs and ensures full payment against due invoice. In circumstances, where weighing of products is required like produce, grocery, meat shop etc, weight scale integration reads the weight from scale and shows the price in relation to the relevant product making it convenient and effective. We support all types of commercial grade barcode scanners, printers, caller ID from major brands. A little smart work at the initial stage can compensate you with suggested purchase order quantity well in time to ensure that you never go out of stock or display. The stock position can be evaluated frequently which can further be modified keeping in mind the upcoming festivals or season time. Primary or Secondary vendors can be selected to keep the flexibility for good prices and faster delivery. The system automatically creates multiple purchase orders based on selected vendors with the flexibility to opt for the delivery at business, shipping or any other address. These purchase orders can then be put in the mail or emailed on registered mail ID of the vendors for a quick action. Upon delivery, the business can receive goods in full or part by simply crosschecking the invoice with purchase order and a single confirmation will update respective quantities and create a back order for items short supplied. Alternatively, the business can still receive merchandise without a purchase order. Vendor Management is very important for the smooth operations of any business and information like business name, contact person name, address, phone number and email ID for every vendor can be maintained for each vendor for quick access for follow up and necessary action. System also allows search on majority of these parameter. Each inventory item can set up a priority vendor due to pricing, quality, delivery time or FOB Delivery option etc along with a secondary vendor as a backup. Vendor ledger can also be referred to analyze payment details for each vendor. 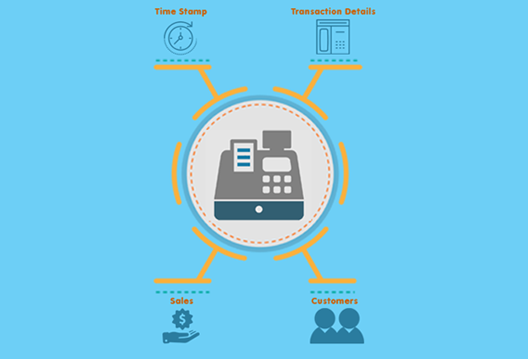 Order processing is very fast and effective through a proper POS System. 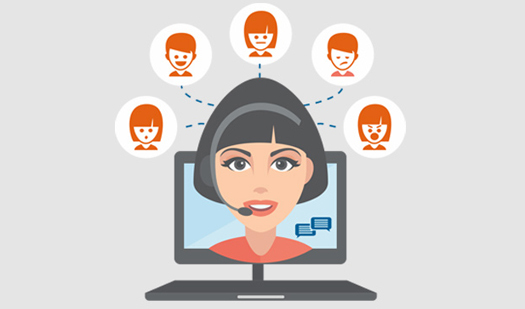 It adds to the customer experience and dramatically reduces service time for busy locations by effectively communicating between different departments consistently eliminating verbal communications. It further offers convenience through right price, inventory management, bar code scanning, weighing scale integration, label printing, reward points, discount options, order cancellation, return management and gratuities. There is a direct payment options through certified integration with major Debit/Credit machines. Various deals can also be handled within the system for a better footfall or to liquidate the ageing stocks. The system also offers control through employee access codes creating a sense of authority and accountabilities. Multiple stations provide best solutions for high traffic business areas communicating with each other on real time basis. It allows to add up new accounts to the customer data base during order processing which can be used for next purchases or future promotions. It also provides an option to email the receipt for those tech savvy and environmental conscious customers. 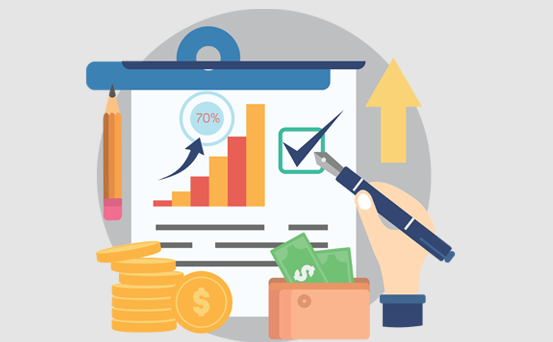 Reports provide insight into the comprehensive working of any organization which can be used for planning, analysis, reporting, audit, training, advertisement and marketing campaigns. With complete access to sales, inventory & customer data, planning & decision making becomes very realistic. Reporting option is very flexible with POS. Various reports offer insight into Sales Trends, Inventory Levels, Reorder level, Customer Data and support operations with Multiple Sales Report, Tax Reports, Audit Reports, Clock In & Out, Shift Report, Customer Ledger and Payout Reports to name a few. Most reports can be filtered for preferred output with option to run status for current date, previous week, month or year. 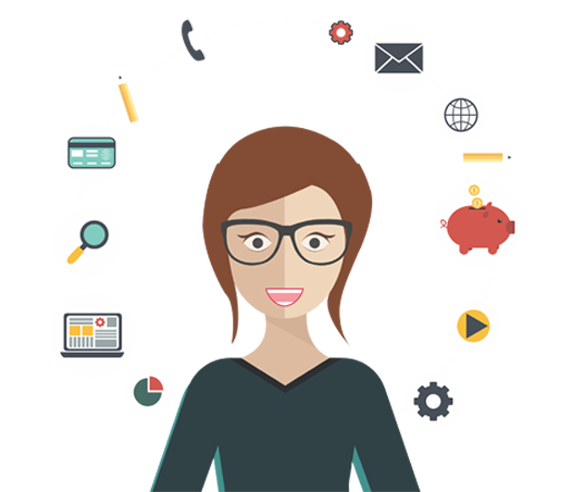 Any business specific report can be customized on requirement basis.